A more traditional source of revenue for the owners of misinformation websites is direct advertising. Elsewhere, we’ve already detailed how the owners of disinformation websites use Programmatic Advertising and Cryptojacking to make money with their sites. In cases where the misinformation website provides valid contact details, interested advertisers can approach the site directly in order to advertise on their site. Due to the level of anonymity with which most of the misinformation websites operate, this is the exception rather than the rule. These “banner ads” consist of screenspace on the webpage reserved exclusively for that advertiser. It can take any shape or form that the website owner desires, and can be likened to a traditional billboard ad. 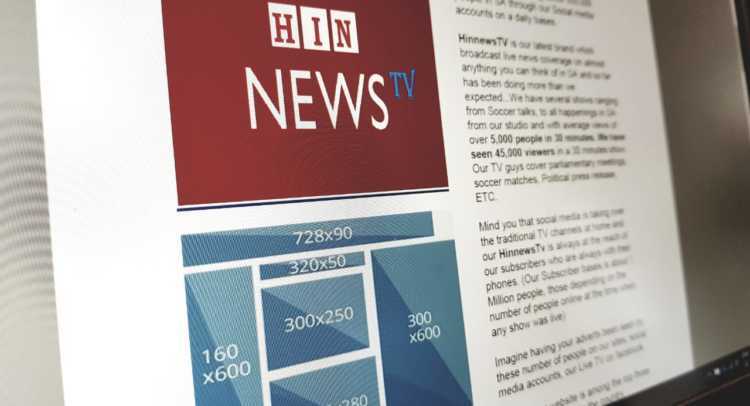 News24 obtained a copy of popular misinformation website HINNews.co.za’s advertising rates. A leaderboard banner, usually found at the top of a website right next to the logo, would set you back R12 800 for a 24-hour period. A square advert placed between the paragraphs of the site’s content costs a little less than R15 000 for the same period. Facebook and Twitter ads, presumably consisting of a tweet or post, will set you back R1 500 per post. The brochure also contained some traffic statistics for the group of sites. News24 has also seen an email trail and invoices rendered by HINNews.co.za in respect of such direct advertising services. In the correspondence, HINNews’ representative “Sam” indicated that R12 000 would secure a single banner advertisement and 30 days’ promotion on the HINNews Facebook page. They also offered different sized banners, ranging between R5 500 per month and R9 000 per month. A sponsored post on the HINNews Facebook pages would set you back R3 000. “We see an average of over 80 000 visitors daily and 70% returning visitors..Our users are working class people. The prices above are negotiable if its a long term thing.